Turning ideas into reality – this is the motto of the new Technology Center at PI (Physik Instrumente) that was inaugurated on front of more than 100 guests at PI's headquarters in Karlsruhe, Germany. "We want to develop the products of tomorrow in the new Technology Center so that not only, we but also our customers will be able to maintain market leadership in the future", emphasized Markus Spanner, Chief Fi-nance Officer at PI. The new building has a total area of 10,000 square meters and, in addition to 200 workplaces, also has application laboratories, measurement rooms, cleanrooms for vacuum, and cryo-chambers. All development departments have been amalgamated into the Technology Center. This proximity and the shared facilities are intended to promote interdisciplinary exchange as well as create an active and creative working environment. "This is the only way to attract new customers, continue to inspire existing customers, develop new markets and applications, generate growth, and offer additional as well as protect existing jobs“, says Dr. Peter Schit-tenhelm, Managing Director of Operations. The heart of the Technology Center is the Karl Spanner Auditorium with 200 seats for seminars and joint lectures with universities. PI has occupied a top position for precision positioning in the worldwide market for many years and has invested 13 million euros from its own re-sources in the building of the Technology Center. It took more or less two years from the initial conception to the move into the Technology Center. "We operate in a high-tech sector that has a profound effect on the future. There are no modern high-performance microchips being manufactured that PI is not involved in. Motion, positioning, measuring, and controlling with the highest accuracy will continue to be our objective in the future and the main reason why we made the decision to build the Technology Center” explains Dr. Karl Spanner, company founder and President of PI. 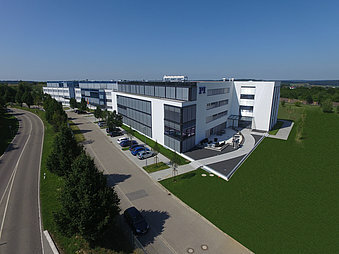 Following the transfer of headquarters in 2001 to Karlsruhe and the build-ing extension in 2012, the 3rd building phase underlines and renews PI's commitment to the company location in Karlsruhe. Dr. Frank Mentrup, Mayor of Karlsruhe emphasized the great importance of PI as economic factor and figurehead for the technology region of Karlsruhe. Harsch Fertigbau, the building company that has worked together with PI on ten previous building projects, took only eleven months to erect the four-story building.